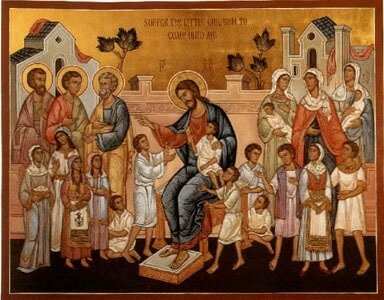 The term Catechumen comes from the Greek word, κατηχούμενος (katecoumenos). This term essentially refers to someone who is being taught by word of mouth, the Gospel and the teachings of the church. We see an example of this word in Galatians 6:6: "Let him who is taught the word share all good things with him who teaches" (RSV). The Catechumen is on a journey to reception into the Church by Baptism and Chrismation. Catechumen Programs go back to the very beginning of the Church. St. Paul's missionary journey's and epistles served the Church in this manner as did the rest of the Apostles teachings. Click the button below to view or download our Catechumen Manual. A catechumen is one who is preparing for baptism in the Church. In modern usage, catechumen can also refer to one who is preparing for chrismation (or another form of reception) to be received from a non-Orthodox Christian communion. In the ancient Church, the catechumenate, or time during which one is a catechumen, often lasted for as much as three years and included not only participation in the divine services but also catechesis, formal instruction from a teacher, often the bishop or appointed catechist. Before becoming a catechumen you will be expected to attend Liturgy until you and the priest are confident about your decision. You will then will be received as a catechumen by prayers. During your catechumenate you will be expected to attend Liturgy regularly. As a catechumen you are a part of the community, “by intention” and should begin to participate in the various activities and disciplines of the Church.